This is a basic gf buttery, flaky pie crust that is easy to prepare. Combine butter, flours and salt with a pastry blender or food processor. Slowly add in water, until dough forms into ball. Flatten into disk, wrap and refridgerate for at least 1 hr. Roll out and place in pie dish. It’s ok if it is crumbly or falls apart, just push back together. Place back in fridge and chill before baking to ensure it will keeps its shape. Bake in a preheated oven at 325. *please be aware that almond flour browns quicker than most, so use a pie crust shield if you have one, or tented tin foil works just as well. Hey Michelle, I am SO proud of you for getting this up and running and I will be eagerly awaiting your next recipes. I’ll have to make a trip to the grocery store to get the supplies. Have you listed where the best suppliers are? That would be excellent! Thanks Kim! I am in the process of organizing my site and will be adding my suppliers and best products to use very soon. Is this recipe also low carb? I’ve never used almond flour or coconut flour and trying to keep the sugars from spiking this Thanksgiving. I’m sure it could work, but I don’t have an exact measurement to give you, as almond flour works a bit differently. It will be a little bit of an experiment, please let me know if you try and how it turned out. People are always looking for substitutions and that would be helpful to know. Do you have any suggestions for a dairy-free butter substitute? This looks like such a perfect recipe, but I’m unfortunately allergic to dairy. I use coconut oil often as a butter replacement. Best of luck! Hi! How long do you bake the crust? Then just use it like a regular crust if baking a pie, so it would be twice baked?? Thanks! You only need to pre bake the pie crust for a filling that does not need to be cooked, otherwise for an apple pie or something like that, there is no need to pre bake it. It will cook thru while the filling bakes. When my husband and I went wheat free a few months ago (severe IBS and other health concerns), the biggest worry he had was missing his favourite pie in the whole world……a blueberry/cherry pie that I make once the fruits are in season here in Ontario. This year, a very early frost devastated much of the cherry blossoms but the blueberries are doing great! Despite this fact, I managed to find some sour cherries at our local market along with some ‘just picked’ blueberries when I was there on Saturday. I promised Jim I would try to make him a pie using your Gluten Free pie crust recipe. Well not only did I make it…….it turned out to be one the best pies I have ever made…….period! I am sending you a picture of my accomplishment……..your crust looks and tastes wonderful! Thanks so much for all of your wonderful recipes……..I have a month off for summer holidays and I intend to try many of them! You know I have yet to make this crust into a quiche. I have gotten so used to making frittata’s (crust-free egg casseroles), but I’m sure it would work! Please let me know how it turns out for you! I always use blanched almond flour. Good to have you here! Hello and thank you for posting, most recipes’ are so complicated and have a TON of ingredients……..this looks so simple and easy to do ….thanks again!!! I am so glad to have found your site…I have just begun trying to be wheat or Gluten free while controlling the amount of carbs I eat…it makes it real tough as I have always been the cook in the house and have to feed others who don’t necessarily have to have the same diet…I am always looking for substitutions, but have come to realize it’s not a 1 to 1 ratio…or even what works better than others…I am very new at this and any information is always appreciated! This recipe could same me a lot of time and effort especially at Thanksgiving! Thank you! I’m trying to make an apple pie but your gluten free pie crust doesn’t have a required time for cooking. How long do I cook the crust for. None of your pie crust recipes have times for cooking on them. If you could let me know it would be great. I live your recipes and hope this turns out well. “You only need to pre bake the pie crust for a filling that does not need to be cooked, otherwise for an apple pie or something like that, there is no need to pre bake it. 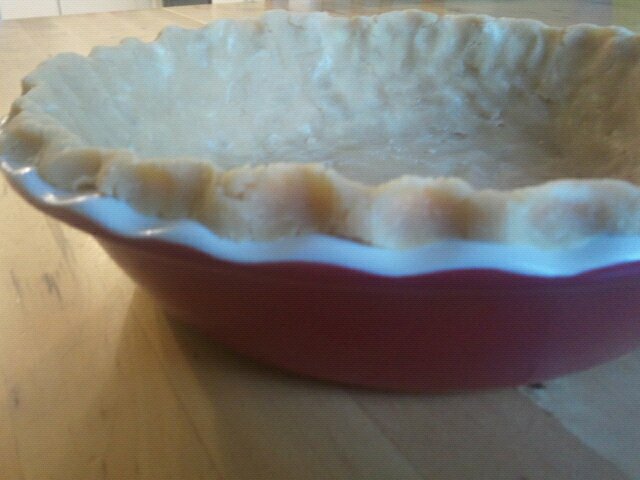 It will cook thru while the filling bakes.” She also warned to use a pie shield or tin foil so the crust does not burn. I just want to thank you so much for your wonderful website, Michelle. It is recommended in the “Wheat Belly” cookbook and for good reason! I am brand new to the GF lifestyle and still in a state of mass confusion but I must be doing something right because I feel better than I have since I was young and my huge “wheat belly” is rapidly shrinking. It is wonderful of you to spend so much time helping others! I know this is kind of an old post, but could anyone help me? Would it be possible to substitute tapioca flour for the almond flour? How long do you bake this (I know you only ‘pre bake’ if your filling doesn’t require cooking…) but let’s say you don’t ever make pies (ME) and you want to know a standard time so it doesn’t burn with said filling in it? Thanks!! I’m very eager to try this for Thanksgiving.